NEVADA – Getchell Gold Corp. of Burlington, Ont., is sharing what it knows about its Hot Springs Peak gold project in Humboldt County while it waits for assays. The property is located on a structural intersection similar to the historic Getchell mine. Four reverse circulation holes totaling 1,212 metres were drilled to test geophysical targets roughly 300 metres below surface. Chips from three of the holes were so silicified in the lower 100 metres that the original host rock could not be identified. Hole HSP-RC-4 contained most elements of a gold system alteration; it returned 150 meters of red, black, white and green jasperoidal silicification, decalcification of limestone, and argillization. The reverse circulation drill depths were limited by groundwater and collapsing breccias. 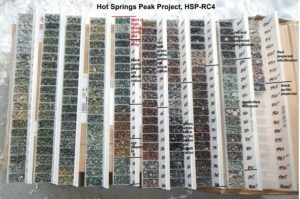 Visit www.GetchellGold.com for more information about the Hot Springs Peak project.